This is a terrible thing to see at 5 in the morning in my underwear. I don’t know where to start. It’s so jarring and awful, a collision of unpleasant forms and surfaces. I fear for anyone dwelling too long on this card. There should be contests to see who can last the longest staring at it before screaming into the night. I fear for Bob Hamelin, too, that he will incur a massive paper cut on his jawline, that he suffers from amnesia and so carries not only his name under the brim of his cap but also on a large paper sign stapled to his chest. I pity him. I hate him. Is it his huge face crowding the frame? Is it his air of mournful need? The hint of a mullet on one possessing such a broad, smooth face and such clean, featureless glasses seems to speak of an age in which there is no rhyme or reason, no up or down. A mullet on Jose Canseco or Rod Beck I understand, but this? It makes me want to move my family immediately to a rural fastness far from any TGI Fridays. Oh, beauty, truth, where are you anymore? 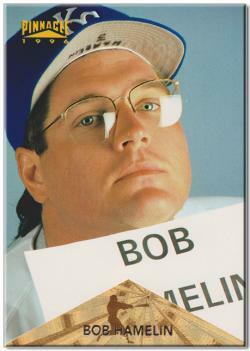 You are currently browsing the archives for the Bob Hamelin category.